Rodama: a blog of 18th century & Revolutionary French trivia: And it's Frogs for dinner! The story is told by Samuel Breck, who was a young boy when the first French troop transport ships arrived in Boston in May 1781. The colonists, Breck tells us, were not used to the idea of Frenchmen as allies and had swallowed whole the account of French diet served up by English propaganda. Everyone, he reports, believed implicitly "every vulgar story told by John Bull about Frenchmen living on salad and frogs". Most of the town, who had never seen a Frenchman, rushed to the docks. They were astonished to behold not the "gaunt, half-starved, soup-maigre crews" of English propaganda but "plump, portly officers and strong, vigorous sailors". Nonetheless misunderstanding was not dispelled. Everything was furnished that could be had in the country to ornament and give variety to the entertainment. My father was one of the guests, and told me often after that two large tureens of soup were placed at the ends of the table. The admiral sat on the right of Tracy, and Monsieur de l'Etombe on the left. L'Etombe was consul of France, resident at Boston. Tracy filled a plate with soup, which went to the admiral, and the next was handed to the consul. As soon as L'Etombe put his spoon into his plate he fished up a large frog, just as green and perfect as if he had hopped from the pond into the tureen. Not knowing at first what it was, he seized it by one of its hind legs, and, holding it up in view of the whole company, discovered that it was a full-grown frog. As soon as he had thoroughly inspected it, and made himself sure of the matter, he exclaimed, "Ah! mon Dieu! un grenouille!" then, turning to the gentleman next to him, gave him the frog. He received it, and passed it round the table. Thus the poor crapaud made the tour from hand to hand until it reached the admiral. The company, convulsed with laughter, examined the soup-plates as the servants brought them, and in each was to be found a frog. The uproar was universal. Meantime Tracy kept his ladle going, wondering what his outlandish guests meant by such extravagant merriment. "What's the matter?" asked he, and, raising his head, surveyed the frogs dangling by a leg in all directions. "Why don't they eat them?" he exclaimed. "If they knew the confounded trouble I had to catch them in order to treat them to a dish of their own country, they would find that with me, at least, it was no joking matter." Thus was poor Tracy deceived by vulgar prejudice and common report. 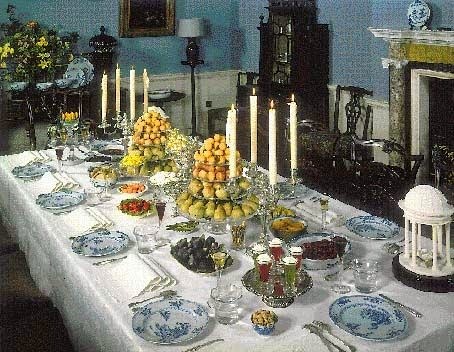 He meant to regale his distinguished guests with refined hospitality, and had caused all the swamps of Cambridge to be searched in order to furnish them with a generous supply of what he believed to be in France a standing national dish. Samuel Breck, Recollections, with passages from his notebooks (1771--1862), p.24-6. But the frogs shouldn't be whole.